The value of any POS system is found in it’s reporting engine. This is where Digital Dining shines. For any restaurant owner to make good decisions, he or she requires having good information at the right time. Digital Dining assists with those critical management choices by equipping the restaurateur with the most powerful restaurant reporting tools in the industry. Not only do we offer more reporting features than any other system in the industry, but we’ve made it easy enough for even the newest of restaurant owners to manage. Any of Digital Dining’s reports can be scheduled as a report package and can automatically be generated as a part of a scheduled task. Reports can also be packaged up and added to the sequence of events that take place at the restaurant’s end of day processing. Digital Dining is tracking every time the restaurant receives revenue. How each check is paid is a critical source of information for restaurant owners. Understanding every Visa, Mastercard, Debit, Cash, Cheque, House Charge, and Gift Card transaction in detail can sometimes be the difference between success and failure. Report on revenue received by type, amount, and by staff member who received it. All reports can be run by any time and date, or a variety of preset periods. Once the restaurant owner finds their favorite report, they can save it and report on it again and again without having to rebuild it. The most common request we receive when a new restaurant opens is to provide reports on sales. Digital Dining manages this better than any restaurant point of sale system. Report on any category or subcategory, any item, any price, or anyone who sold it, between any two times and dates. Curious to know if this month was better than last month? That’s easy with Digital Dining’s Comparison Reporting. Need to understand sales volume by hour on weekdays to aid with staffing? That’s easy with Digital Dining’s Time Interval Reporting option. Need a beer bottles sold report for counting purposes? Need a food sold list for replenishment? Digital Dining has all these Sales Reporting options. Controlling discounts and promotions in a restaurant can mean the difference between profit and loss. Understanding who requested discounts, and who authorized them, and for what is critical to good promotion management. Digital Dining allows restaurant owners to report on any number of key discounting metrics to make sure discounts are being used effectively to improve sales, and not being abused. Understanding exactly how many coupons were received from a magazine ad, or precisely how many ½ price meals are provided to staff are important things that can easily be reported in Digital Dining’s restaurant report system. Every restaurant has income that isn’t “food” or “beverage”. Anything from logo merchandise such as shirts or hats, rental income from a tenant, or a deposit paid on a catering contract, is often considered other income by a restaurant. This “other income” category can easily be reported in Digital Dining’s restaurant reporting system and be kept separate from food or beverage report totals. Your restaurant staff are going to make mistakes. When they do, they’re going to do voids. Everything is fine and customer service is maintained until someone decides to abuse the system. That’s when the restaurant owner loses revenue not only from the errors, but also from the abuse. Fraud and theft from voids abuse is not easy to catch, but everyone agrees that monitoring voids for patterns and excesses is where you need to start. Understanding voids requires easy to run and easy to read void reports, and Digital Dining has them when you need them. One of the largest cost inputs in any business, understanding the cost and value of labour is critical to any restaurant’s success. Restaurant owners that use Digital Dining’s time and attendance system can report the number of hours employees work in your restaurant. Digital Dining can separate that labour from front of house and back of house, and also management. Digital Dining can also report on the total cost of labour for any given period so that managers can compare it to total revenue. Every restaurant owner wishes that they could have a manager that watches over the shoulder of every staff member on every order. Digital Dining is the next best thing! Each time Digital Dining allows for a security override, either by code, card swipe, or by fingerprint, Digital Dining records the details. Digital Dining’s security reports allow restaurant owners to monitor the security exceptions allowed by employee to get a better understanding of who is doing what, and when, so that they can go and find out the “why”. No one likes to collect them, but everyone must, and inevitably report and pay them. 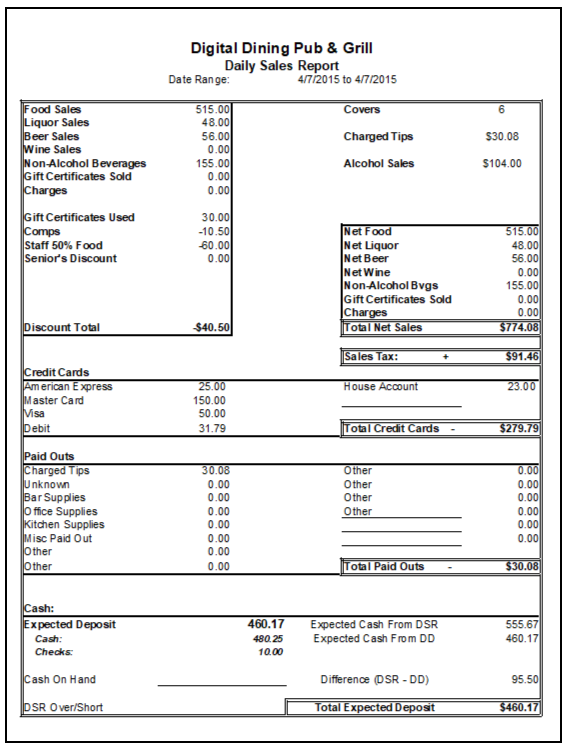 Digital Dining sales tax reports allow restaurant owners to break down HST into the appropriate PST, PST Food, PST Liquor, and GST numbers so that they can be properly accounted for and paid on time. In addition to the Tender Reports, Digital Dining has a specific Gift Card and Gift Certificates reporting system. These reports allow restaurant owners to understand the gift card liability accumulated, and the outstanding balances on gift cards and gift certificates issued. All day long restaurants, like any business, have small expenses that require payment. Whenever these payments are made from a register or service staff, Digital Dining records it as a “Paid Out”. These paid outs and who did them can be categorized and reported on using Digital Dining’s Paid Out Reports system. Digital Dining has one of the best Check Report systems in the industry. Need to know what was on any check? Recall it in Digital Dining’s Check Reports. It’s not something you’ll do every day, but when you need to reprint a check from a week ago, you’ll know it, and with Digital Dining, you’ll be able to do it! Need a report to be laid out in just the right way? Digital Dining’s General Reporting feature allows restaurant owners familiar with Microsoft Excel to design the report they want and export it out to MS Excel. A common use for this feature is for restaurants to create their own Daily Sales Report (DSR) for easy everyday use of the restaurant data, all brought onto one concise sheet of paper.